It was so hard to get the entire puzzle in a picture! 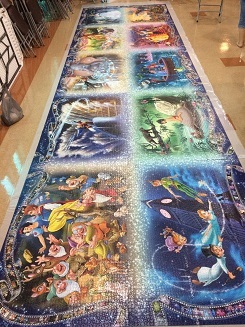 We put down a sheet of thick plastic to display the puzzle on because we would be taking the puzzle apart back into it's 10 sections when we were done and the plastic would help us get the pieces off of the floor. 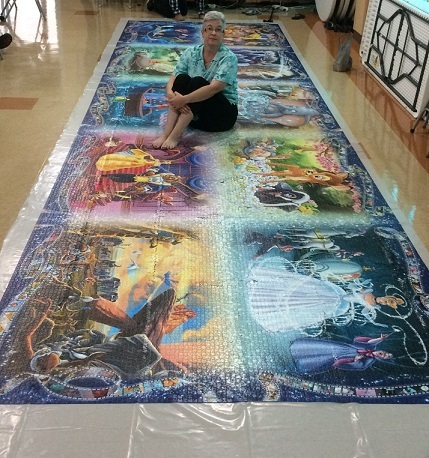 This is myself, mom, and my 3 children in front of the puzzle (hubby was taking the picture). Everyone there helped with this puzzle, even if only to put in one or two pieces - I wanted them to have a part in it. Mom is the only one who, besides me, put at least one piece in every section. Thanks mom, you rock! I like this picture, it really gives perspective on how large this puzzle actually is (and that's just over 60% of the puzzle showing!) Everyone here is looking for the hidden Mickey Mouse icons that are in each section, I was crawling on the puzzle to show them where the icon was in the Fantasia section. No one found them all, but most people had a great time looking and the ones they couldn't find I was happy to show them. The puzzle fit together perfectly, even with a replacement section. I was a little worried about that to be honest, but each piece aligned properly with the next section and went together with many perfect little clicks. Taking a good picture of the entire puzzle was quite a challenge! And here's the best picture of me sitting on the puzzle. I've changed clothes because we left it up overnight and went back the next day to disassemble it. I still don't know what I'm going to do with the puzzle, but I'm hoping to be able to donate it to one of the local hospitals for the children's wing. This puzzle was an amazing accomplishment but I definitely didn't do it alone. My wonderful husband didn't complain when I spent several hundred dollars on one puzzle, helped to construct the board I assembled each section on, made me an adjustable puzzle table on which to work it, figured out how to get each section off the board and store them, and encouraged me every day. Mom helped with each section, and was the only one who was always interested to hear how things were going. She is as puzzle obsessed as I am, so she was always appropriately excited about my progress and helped supply me with plenty of encouragement and thrift store puzzles to do in between sections. I loved assembling this puzzle, and I've very much enjoyed re-living it with this series. 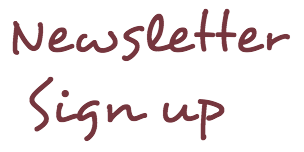 I hope you've enjoyed reading it as much as I've enjoyed writing it. If you'd like to read the recap of all 10 sections click here; if you'd like to see my final assembly day post click here. 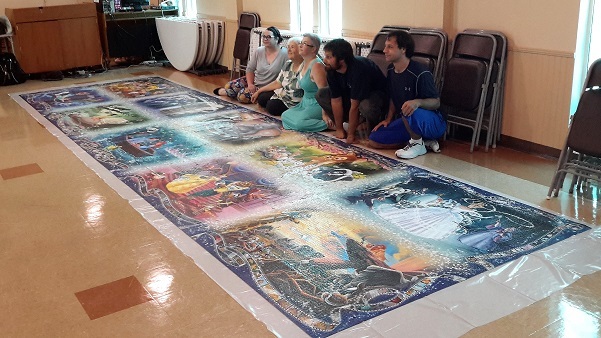 It is almost 27 feet long and over 6 feet high, and the puzzle comes in 24 bags of 2000 pieces each (that's a little more manageable if 4000 piece puzzles seem too big). The images are interesting and the colors are very pretty, but I've never done a Grafika puzzle and have no idea of their quality. Grafika puzzles are made in France, and the shipping to the US is considerable. It's such a large image that seeing the detail is difficult in this picture; it looks like an interesting puzzle though. It measures 24.5 feet by 5.15 feet and comes in 7 bags of 6000 pieces each. Yikes! I definitely don't have a board large enough for 6000 pieces. I wouldn't say no to assembling it if it were given to me, but I don't know that I'll be going out of my way to get it. I think I'm good for a while unless another image comes along that really strikes my fancy. I assembled the World's Largest Jigsaw Puzzle while it was still the world's largest, I'm ok with that accomplishment - I don't feel like I need to keep going bigger and bigger. But that's just me, if you're wanting to take on either of these bigger ones I'll be cheering for you!